Dark Chocolate Peanut Butter Pretzel Bark made with just three ingredients!! 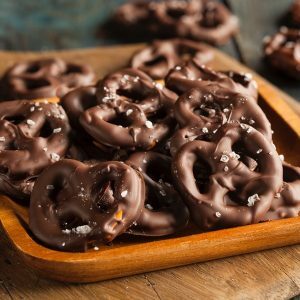 A perfect sweet and salty treat to gift to neighbors and snack on through the holidays! One of my favorite sweet-tooth fixes is a spoonful of peanut butter sprinkled with chocolate chips- sometimes milk chocolate and sometimes dark. Sometimes I grab a few pretzels to add some salty to the sweet, plus a little bit of crunch. So the thought of this Dark Chocolate Peanut Butter Pretzel Bark made perfect sense! There’s a good chance you have all THREE ingredients needed to make it sitting in your pantry. Dark chocolate chips (if not, use milk), peanut butter, and pretzels. I love using the big, thick sourdough pretzel twists! Ohhh, I could eat this stuff all day–okay, maybe I did. Melt dark chocolate and peanut butter together over a double broiler stirring until smooth and creamy. Remove from heat and pour over crushed pretzels in a large bowl. Chill in the refrigerator until firm. Break into pieces and serve.